With the announcement of the Nikon D800 and the D800E, you might wonder which camera is best for you. This article is intended to highlight the crucial differences between the two cameras and ultimately help you decide which camera better suits your needs. The Nikon D800 and D800E DSLRs are both highly capable cameras featuring a 36.3-megapixel FX format full frame CMOS sensor. They both support full HD video recording at 1080p and have extensive low-light sensitivity to ISO 25600 in expanded mode. Both also have a fast 51-point autofocus system and support up to 4 frame-per-second continuous shooting. These cameras are identical in most regards; however, there is one notable difference between them that should be a factor in deciding which model is the right one for you. Let’s look at the way in which images are captured to help outline the major differences between these two Nikon cameras. All Nikon DSLRs incorporate an optical low-pass filter (OLPF) in front of the imaging sensor that blurs the image very slightly to help reduce false colors and moiré patterns. These artifacts are an inherent consequence of digital imaging and are most commonly seen when photographing very finely detailed patterns. Moiré is created because of the manner in which images are recorded by the imaging sensor; each individual pixel conveys information that has passed through a patterned system of three filters (red, green and blue) to render the image as a digital file. During the exposure, each pixel is exposed to only one of the three color channels, and the remaining visual information is interpolated by the camera. A moiré is the result of this interpolation being depicted with such density that the camera is unable to properly resolve it. Moiré is commonly countered by the OLPF, and the blur that it causes breaks up this density of visual information, allowing for smooth representation of patterns with natural colors—but at the cost of a slight reduction in sharpness. The D800 makes use of this OLPF and produces images that have a high resistance to moiré and color shifting. This OLPF also acts as an anti-aliasing filter and helps to reduce aliasing that is caused when photographing hard-edged subject matter. Similar to the way moiré patterns are caused, aliasing occurs when photographing tight patterns and skewed lines that are difficult to render due to their visual frequencies. The filter scatters the light rays and breaks them down by defocusing slightly. This minute decrease in sharpness can give a more natural and fluid appearance, with longer tonal gradations. When an anti-aliasing filter is not used, the camera’s sensor sometimes records gradients in a way that makes them appear a bit more choppy and truncated. The D800E is able to produce images with slightly higher sharpness and resolution. The D800E differs from the D800 by incorporating optical glass between its OLPF substrates that eliminates the blurring effect of the OLPF. This optical glass reorganizes the path of light reaching the sensor and essentially un-polarizes it, causing it to strike the sensor in a straight path. By eliminating this effect and straightening the path of the light, images are recorded with higher sharpness and resolution. The idea of increased sharpness and resolution sounds like an ideal consequence, but the risk of spatial aliasing, moiré and color shifting is certainly increased. The D800E does not provide an in-camera solution for anti-aliasing, so it is specifically designed for photographers who can effectively control their lighting situations and are more apt to spend time correcting images during post processing. The benefits of the D800E are also most noticeable when working with the RAW (NEF) file format. When photographing in JPG or TIFF formats with the D800E, in-camera image processing dramatically reduces the efficacy of any subsequent alteration of moiré patterns in post production. Because of this automatic image processing, moiré patterns are essentially fixed into the file and dramatic pixel manipulation will be required to remove them during post production. By contrast, with the D800, your workflow can be the same whether you’re recording RAW (NEF) or JPG or TIFF files. It should also be mentioned that while the moiré patterns will be more prevalent in images captured with the D800E, image processing tools such as Nikon’s Capture NX 2 and Adobe Lightroom 4 now feature plug-ins to simplify the removal of aliasing. This addition to your workflow could prove to be quite a chore when bulk-editing files, but these tools are promising solutions for moiré elimination. Both cameras feature an optical low-pass filter (OLPF); however, only the D800 truly makes use of it to reduce aliasing, moiré and false color. The D800E incorporates an optical glass element between the substrates of the OLPF that negates their effect and results in greater sharpness and resolution in imagery. This increase in definition comes at the expense of an increased likelihood that moiré patterns and false colors will occur. The D800E is an ideal camera for photographers who can very precisely control their shooting situations (i.e. studio and commercial setups). This involves control over the lighting, a steady camera (often with the use of a tripod), the ability and desire to photograph with middle f/stops (roughly f/5.6 to f/11), photographing only in RAW (NEF) file formats and a post-processing workflow that allows for the removal of moiré and false colors. The D800 is an ideal camera for all shooting situations and allows you to work in any file format. There is no compensation required to reduce moiré. With this difference aside, it should be noted that both cameras are highly capable of recording outstanding imagery. While the D800E could be perceived to be the better camera, this is certainly not true for everyone. You should make a careful consideration of your personal needs and shooting styles before determining the best model for you. Thank you, but I still can't make a decision. I am an amateur photographer; which do you think I should purchase? You are clear in your article, but I am affraid of investing in something that I will outgrow fast. Both the D800 and D810 are professional tools, and excellent cameras, so I wouldn’t worry about outgrowing either of them. Unless you are doing mostly studio work or landscapes, the D800 would be the way to go. It lends itself to more universal applications. Thanks for this article. Exactly the information I was looking for. Very informative, very helpful. Appreciate it. I'll buy one of the two cameras, I'm even more questions, I am wedding photographer which of the two cameras you advise for me. For wedding photography, I would suggest going with the D800. The fact that you won’t always be able to control your shooting conditions, along with photographing repeating patterns found in clothing, there is the risk of moiré using the D800E. While some of this can be fixed in post process, it’s not something you want to add to your work flow with the fast turnaround required for weddings. The D800 is going to be the better option. I just bought the 800E. The packaging did not have an AC plug for the battery charger but had a European plug and cord. So I was left wondering if the "E" meant a camera for sale only in Europe. The above table on image formats leaves me wondering if the 800E has all formats or only RAW format. Is that true? I am sorry you received a model with a European plug and cord. I am not able to account for why you would have received that as opposed to an American AC outlet charger. To resolve that you must contact our Customer Service Dept directly, and they can access your order details and help to resolve that for you. You may email them at cs@bhphoto.com. As far as the D800e “E” designation goes, it is not indicative of a model made for Europe. Nikon makes two models of the D800 as discussed in this article, and the “E” version being a special model lacking an Optical Low Pass filter, which in doing so will allow for sharper images to be captured and processed. The above table mentions each camera’s “Ideal file format” type which is different from listing all the possible file formats of each. The D800e excels in RAW type format, but also can be set to capture Jpegs and TIFF files. Sony a99 he will be Shooting video recording Auto foucs ? Nikon d800e in this Shooting video Recording auto foucs Y/n ? For video, the D800 would be a better option over the D800E. That being said, both cameras do have autofocus during video. It is contrast autofocus, though, so isn’t overly accurate. You will get far better results manually focusing the lens. The A99 also has autofocus during video. It’s autofocus during video is a bit better than the Nikon’s video autofocus, as it is phase detection autofocus. "... the imaging sensor that blurs the image very slightly to help reduce false colors and moiré patterns. These artifacts are an inherent consequence of digital imaging..."
These artifacts are an inherent consequence of Bayer sensors, but are absent in Foveon sensor DSLR cameras. I too agonized over the decision of D800 vs D800E. I primarily shoot products in a studio with very controlled conditions. However, upon further research and comparison, I saw that the 800E's "sweet spot" is in the middle F-stops, and for my work I routinely shoot at F22-32. At that aperture there's basically no advantage to the 800E. Any other work I do out of the studio is more safely done with the 800 anyway. Another important thing to realize is that even a small amount of post production sharpening will often make the D800's images look as sharp, if not sharper, than the 800E. And 99.9999 percent of people will never know the difference. I want to know if Nikon 800e is a better choice for astrophotography as compared to NIKON 800- specifically deep sky imaging. Thanks much. It seems you guys almost always recommend the D800 over the D800E. According to your advices the D800E is only useful in controlled lighting situations, using mid-apertures and shutter speeds of 1/125th or above. Now this is all very understandable from a technical standpoint. My question: what *type* of photography would you recommend a D800E for over a D800? I'm studying photography in college to do weddings, fashion, pin-up, and boudoir. Adobe Lightroom 5 is my primary tool for ingestion, develop, and export. Is the D800E model more appropriate for what I plan to do? I am an artist (painter)with a background in photography. I want to use the camera to 1. Shoot my paintings for subsequent prints on canvas and fine art papers/metals, 2. Shoot multiple-figure-narrative set-ups for use to make paintings, and, 3. Shoot people for some portraiture commissions that come my way. I am still not sure which way to go. I can use Photoshop (CS5). I need the pictures to be very sharp (to see brushwork) and color-accurate for subsequent printing. Do you think the 800 would be sharp enough for these purposes? Great break down. Thank you!! I'm a wedding photographer and have two D600 but I don't feel they are as sharp as they should be and the oil spots have kicked in. I want to upgrade to the D800 or D800E but after reading all these comments, I'm not sure which way to go. I work with Lightroom and Photoshop. Is the magnification on the camera back view screen sufficient to detect moire in most cases, assuming you'd know where to look based on what patterns might induce moire? I like shooting at the absolute sharpest aperture. 4x5 Sinar and Velvia or Kodachrome in an F3 with MF Ai 24 f/2.8 were my favorites. I recently bought that lens again and am looking to get as close to the chrome sharpness as I can. Leica M9 results are the only thing I've seen that seriously compete with film. Anti aliasing filter is my logical suspect. D800 D800e...I have been mulling over it for months. I think just about anytime a manufacturer adds an E or an X to a product name its assumed that is the better one. But all I really shoot is wildlife and much of that in thick rainforests in the tropics. So I cannot control light, often have to use apertures of 2.8 and "hand hold" at 1/60 or so. There are NO architectural patterns to worry about in the Amazon. Given all that the D800 seems to be for me. The increased sharpness claimed of the D800e is very attractive but frankly I don't see all that much of it in the images you post or that others have put up for comparison. I say its the D800 ( the D800e might actually be problematic in my work ) for me..what do you think? I am not a professional. I have used D90 and am happy with it. thinking about upgrading. will be using for family photos indoor/ out door and for holidays. i love night time photography. also i will need it for photos of surgical field for teaching. Please advise which one to buy: D8000 or D8000e. Or shall i stick with my D90. I have just ordered the Nikon 2.8 24 70 and also have the Nikon 2.8 70 200 VR along with the 35 70 that came with my original D70. I also use the 55 1.4. Now I am considering a new A different bbody and obviously the D800 or D800E are under consideration. I am a casual amateur, and shoot sports, both indoor and outdoor, wildlife, events, portraits, architecture, weddings etc. Anything that catches my fancy. Would you recommend the D800 or something else? Thank you. For night shots and low light situations with slow shutter speeds, do you prefer - the D800 or the D800E? One more question...Can I use Photoshop CS6 to decrease moire? I'm looking to D800/D800E to upgrade from my D90. I mainly shoot landscape so I prefer D800E. But I'm still in hesitation to choose between these two. I know how to gain the super sharpness from D800E by using lens recommended, f/5.6-f11, tripod, high shutter speed if handheld, shooting raw, etc. In most situation, I can follow these rules. But there is a chance that I can't follow these rules strictly. I may shoot f/2.8 or f/14. When the light is good and I don't care about the image quality that much, I may shoot landscape without a tripod. I may shoot people at 1/80s-1/100s when tripod is not acceptable. Would you please tell me, in all these situations above, when moire and false color are excluded, will I get the identical image quality as an D800 from a D800E or actually the quality is worse then D800? I am trying to decide between the D800, D800e and the D4. I think that the D800s might be better because they are smaller and I can rent the D4. Do you think that makes sense? What would be better for me the D800 or D800e? I shoot portraits and fashion. I always shoot RAW and use Lightroom 4 (and photoshop) and am confident with my post production workflow. I shoot on location with lights or just a bounce and then also in the studio. My concern about the D800 is the necessary tripod use. For fashion I can shoot in low light sometimes and am moving around quite a bit. Tough choice and sadly, I have not had the chance to use the D800E personally (D800 is assume BTW). My only concern is how bad moire issues would negate the increase in image quality (should they occur) and with regards to fashion detail in the clothing. The D4 is supposed to be superior especially in low light shooting due to the larger pixels. I'm having trouble deciding whether to opt for the D800E or D800. I do a lot of product photography in the studio, mainly shoot all types of fine jewellery and watches. I'm thinking the D800E is the way to go but I am worried about moiré and colour shifting affecting my work flow. Could you reassure me which camera you think would best fit the bill? 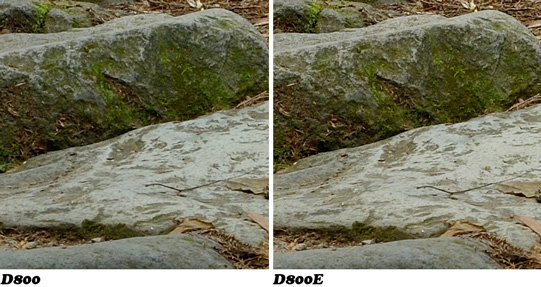 The D800e is provided with special software for correcting the moiré issue that occurs when capturing images with it. If you are comfortable with your current workflow it should not be much trouble adding that program to the flow. By this point the D800e has been out long enough that you should be able to find any of several rental houses that you could rent one and take it for a test drive. If you’re not happy with the results or workflow then you could always opt for the D800. For your stated usage, the Nikon D800 DSLR camera would be my recommendation for your needs. I plan to purchase a Nikon DSLR for underwater photography. I currently have a sealife camera. What Nikon is would you recommend for best results underwater? I am considering the 7000 and the 800. 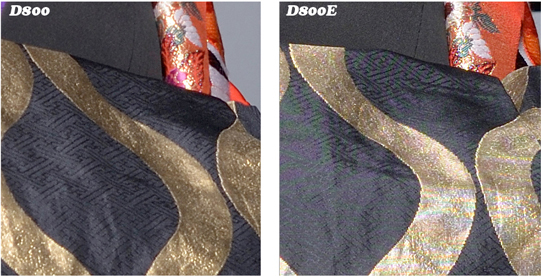 For image quality, the larger D800 sensor would be the better choice. I just want to point out that with regards to lens ports, you have more DX (aka D7000) lens port options especially wide angle than FX. Excellent article: it helped me make my final decision for the D800. I shoot architecture professionally where I control the supplemental lighting and shoot tethered from a tripod. I always shoot in the middle apertures on my lenses to provide the best depth of field. I've also had experience removing moire from images. All of those indicate the D800E would be my logical choice. But I also shoot exteriors where the light is not controlled and often I have to make do with what the subject presents to create a worthwhile image. I'd rather not have to go back and reshoot because of a blurred image or a bit of moire that I can't fix in post. I've compared D800 and D800E images of the same subject side by side and yes, at 100%, I could see a difference between them with the 800E providing greater sharpness. But the gamble on uncertain exterior subjects was too great to risk, so I chose the D800. I currently shoot a Nikon D3 tethered in studio (via Lightroom) approx. 50% of the time. The other 50% of the time, I shoot on location for food photography sessions usually in a restaurant where even though I augment lighting with strobes and modifiers, it can still vary tremendously in terms of lighting and overall environment. I like the D3 but considering I'm shooting food, I would like the extra level of detail the D800 could possible provide to get me closer to the Medium Format results that can be seen in Bon Appetite Magazine, etc. I am considering the D800/D800E and am having a difficult time choosing. This camera will also need to be a general all purpose camera that can be used on location for architectural and even head shots as well. What is your recommendation? Thanks! I currently have two D700's. I shoot mostly high school sports and family photos. The sports are in side, outside, both in day light and at night under the lights. Sounds like the D800 would be better than the 800e? Or should I look at the D4. Hi....for D600 and D800...which one you more recommend? Which would be better for aerial photography/large prints? Questions- Which is better for shooting architecture? Will i be able to print the same size with the D800 as D800E? Will the D800 print museum quality 24x36? What about bigger? After reading a lot of comments on this page, I have the feeling that the D800E is meant to be used in the same environment as the old and famous Kodak SLR/N was to be (well controlled environment, studio, etc...). I've purchased a D800E and wonder if i have made the wrong choice now, after reading your comments. I do a lot of wildlife and macro. If i continue to doubt my choice what do you think are my chances of flipping the D800E to a D800? Is it worth the hassle? I may find the answer if I read all the comments here now but hope you don't mind I ask Is the D800 a good outdoor choice?? My main use is for wildlife and I read a couple forums where folks were saying the 800's are best used indoors (studios). I use a D300 at this time. I currently use a Nikon D90 and just placed an order for the D800. I was wondering if it will be an easy conversion and what differences I will find. Thanks! I am interested in getting some advice for which camera to order. I have ordered the D800 E because I am switching over from a Mamiya 6x7 format and I print 30x40 so I need maximum sharpness. But I also like to work in low light situations and play with natural light a lot so I'm worried the Moire pattern may be a problem. Should I switch my order to the D800? Will it make a difference at 30x40? I recently purchased a D7000 from B&H and have a couple of lenses. The one that I'm worried about is my Tokina 11-16mm. If I purchased a D800 would the image quality be effected either positively or negatively? Or would I basically have to upgrade this lens?